In todays energy conscious environment, natural ventilation within homes is greatly reduced by the introduction of double glazing, draught excluders, fitted carpets (which prevent air movement up through suspended wooden floors) and, with the introduction of central heating and the removal of open fireplaces. Houses have become effectively sealed boxes, keeping in any moisture produced and providing ideal conditions for condensation to occur. Condensation occurs where moist warm air comes into contact with colder dryer air, or a surface, which is at a lower temperature. Air contains water vapour in varying quantities; its capacity to do so is related to its temperature – warm air holds more moisture than cold air. When moist air comes into contact with either colder air or a colder surface, the air is unable to retain the same amount of moisture and the water is released to form condensation in the air or on the surface. Condensation is generally noticeable where it forms on non-absorbent surfaces (i.e. windows, window sills, mirrors or tiles) but it can form on any surface and it may not be noticed until mould growth or rotting of material occurs. Ventilation is most effective if it extracts at the moisture sources and encourages ventilation throughout the whole house. Condensation is encouraged by poor air circulation and cold surfaces which attract moisture (so for example behind furniture and in cupboards because the walls are insulated by the furniture or cupboard and are therefore colder) and the first evidence is often the appearance of mould growth and a musty smell on clothes in wardrobes. The moisture in the air comes from a number of sources within the house. Water vapour is produced in relatively large quantities from normal day to day activities – a 5 person household puts about 10 kg of water into the air every day (without taking into account any heating) – i.e. Lifestyle e.g. Cooking , Bathing and Laundry. Fast moisture production, e.g. cooking or showering causes moisture to rapidly migrate to cooler areas – damp will form in a cool place such as the external wall in a cupboard, in a bedroom or in the corners on gable end walls. Slow moisture production, such as clothes drying, gradually increases humidity (and temperature) with a wider migration across the dwelling. Ambient Temperature and heating cycles. The the variation between the maximum and minimum temperature in a property will impact the extent to which the warm air holds moisture and then the cold air deposits the moisture. The greater the extremes the more condensate is produced. 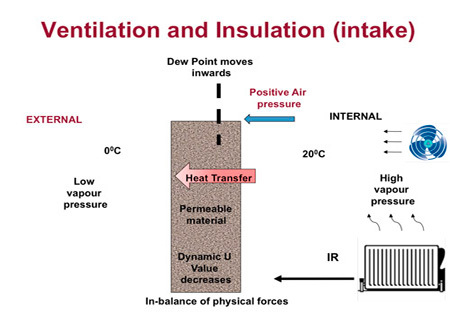 Insulation factors. The greater the insulation the less the extremes in the heating cycles with higher ambient temperatures and therefore less condensate is produced. Degree of mould. Once mould is present, it will increase exponentially as conditions allow. This is exasperated by the fact that mould is a living organism and therefore holds its own water. Clothes drying: Ideally dry clothes outside. Tumble dryers should be externally vented or include a condensate trap. Wherever possible avoid drying inside. How can proper ventilation and insulation help? The Dew point is that point at which water vapour turns to liquid and is therefore the point at which condensate occurs. This varies based on the air and surface temperature and is affected by the humidity. 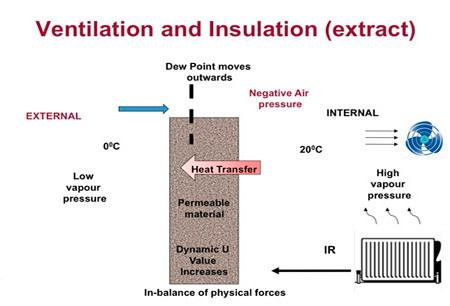 The Insulation Value (U value) is a measure of a materials ability/inability to conduct heat. 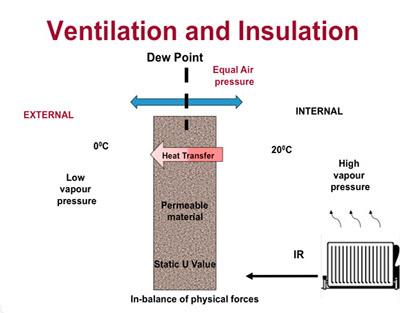 Changing Ventilation conditions within a property will impact the insulation of the building fabric.